Chloe Coscarelli’s highly anticipated follow-up to Chloe’s Kitchen is finally here. 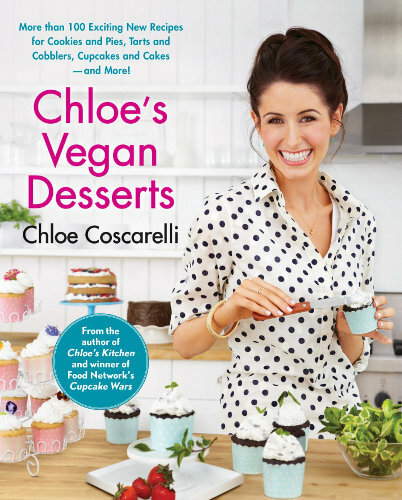 Vegans and carnivores alike have been anxiously awaiting her all-dessert cookbook, Chloe’s Vegan Desserts, ever since Chloe wiped out the competition by whipping up some decadent chocolate orange cupcakes with candied orange peels on The Food Network’s Cupcake Wars. Chloe’s Vegan Desserts offers more than just tasty treats. It includes a section on tips for stocking your vegan pantry, not only outlining imperative ingredients to keep on hand for a quick fix when a craving hits, but also explaining the purpose they serve, which will prove very useful when trying your hand at an original culinary creation. Allergy sufferers rejoice because Chloe has made sure you can have your cake and eat it too! With a quick yet comprehensive guide to allergy-free baking, you can be indulging in gluten-free or soy-free desserts in no time. Filled to the brim with beautiful color pictures of irresistible indulgences that will have you salivating over unique and delicious dishes including Chloe’s award-winning cupcake recipe, lemon bars, chocolate cream pie, and salted caramel cupcakes! I found myself squealing with delight when laying my eyes on the New York-style crumb cake, featured in the Dessert for Breakfast chapter. I made the recipe the very next day and had to hide it to keep myself from devouring the light, moist cake with a sugary crisp crumb topping that is sure to satisfy anyone’s sweet tooth. Chloe’s Vegan Desserts contains a multitude of scrumptious recipes that will appeal to everyone for any occasion. Each page is infused with Chloe’s kind and vibrant personality, solidifying the cookbook's status as your new go-to guide for all things sweet.